Older vessels and aging terminals means we have to take a look at each truck that comes through the tollbooth to prevent damage to the vehicle deck and terminal surfaces. 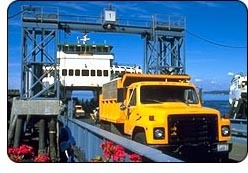 Commercial vehicles planning on using Washington State Ferries (WSF) must take special precautions. This requirement is due to the numerous variables associated with traveling on marine highways, such as: terminal, dock, and/or boat load capacities; terminal and/or vessel clearances; or tidal activity which affects the angle of the loading ramp. 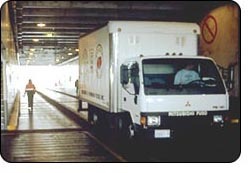 Please note: If the vehicle has a registered GVW for more than 80,000 pounds, but the vehicle and load for the trip in question are under 80,000 pounds, and all height and width criteria are met, the operator may display a dated and printed weight slip, verifying the GVW, in lieu of contacting the WSF for written approval. All other vehicles more than 80,000 pounds, but less than 105,000 pounds, that meet the height and width criteria, must present an approved WSF Ferry Travel Request/Permit. These vehicles will be provided access on a first come, first served basis. Please fill out our Oversized/Overweight Vehicle Travel Request Form (pdf 96 kb) and fax it to us at 206-515-3773. If you are transporting a modular home, please also fill out and fax the Modular Home Measurement Diagram form (pdf 16 kb). Please allow two business days for processing. You can contact us at any time for status updates at 1-888-808-7977 (WA & BC). For oversized/overweight annual renewal requests please note: yearly renewals are not automatic. Terminal weight restrictions have changed with new engineering data. Some renewals may not be approved. Vessel positions are often described as "1" or "2." In general this means the first boat out in the morning is in the number one position. Two then, is the next departure. Where there are more than two vessels assigned to the route, more positions are added. Fauntleroy/Vashon/Southworth has three vessels, hence three sailing positions. Anacortes/San Juan Islands/Sidney, B.C. has four vessels assigned to the route and five during the summer schedule. The position number will tell you which vessel is sailing at what time. Schedule pages have numbers beside the departure to let you know what vessels are assigned. This information is updated daily. Vessels have different clearances and depending on the height of your truck, may or may not be able to accommodate your load. Vessel clearances range from 13' 6" on the Tillikum to 16' on the Kwa-di Tabil and Olympic vessel classes. The Vashon Island and the Port Townsend/Coupeville routes have concerns with tides. Trucks destined for Vashon with less than a 14" ground clearance may have trouble driving on and off the vessel at certain tides. Tidal conditions often cause the cancellation of sailings on the Port Townsend/Coupeville route. WSF will publicize the dates and times these are in effect. All docks have a high volume of commuter traffic at certain times of the day, generally eastbound from the islands and peninsulas in the morning, and westbound in the afternoon and evening. It is not possible to handle oversize loads during these times; WSF encourages truck traffic to travel in off-peak times. The Washington State Department of Transportation publishes a Commercial Vehicle Guide (pdf 2.37 mb) and lists curfews on highways for oversized rigs. These are also in effect for Washington State Ferries. For more information, visit WSDOT's Commercial Vehicle Services. WSF offers reservations in the San Juan Islands and on the Port Townsend/Coupeville route. See our vehicle reservations FAQ (pdf 197 kb) for more information. Fares are charged based on vehicle length and can be found in the "Vehicle Length Based Fares" sections the Current Fares Brochure (205 kb). Any vehicle over 8'6" wide will be charged double the applicable length based fare.